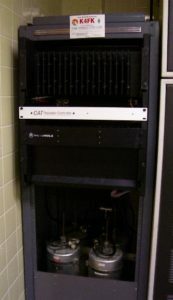 The South Florida DX Association’s repeater is located on the roof of the Florida Medical Center (Oakland Park and Turnpike) on 147.330 output and 147.930 input with a PL of 103.5. The repeater is for the enjoyment of the entire ham community. The purpose of the repeater is to be a DX resource for hams in the area, providing for coordination of DX and Contest activities. You are encouraged to use the repeater to call in DX spots, discuss DXpeditions, discuss propagation, etc. Please limit long rag chews about non-DX topics and give priority to DX spots. Our repeater system has been operating for many years and quite well, thanks to our Repeater Manager Elliot KB2TZ. The repeater is a Motorola operating at 110 Watts out, 80 watts out of the Duplexer and is tuned for optimum performance. The antenna is a Stationmaster cut to our frequency. It is the best antenna available for that application and one that is in use commercially. The transmission line is 7/8” Andrews cable installed with “N” type connectors. A preamp is installed on the receiver for an additional 6 dB gain. Elliot does performance measurements on the entire system every six months. We are most fortunate to have such a fine operating repeater.